Klapmeier. Most pilots flying today will know that name, for it's the family name of the brothers, Alan and Dale, that started the only, truly successful airplane manufacturing company to get off the ground in the last fifty years. If they don't know the Klapmeiers' name, pilots will know Cirrus, the company they started. Many manufacturers have come and gone over the last fifty years, but only Cessna, Beechcraft, Mooney, and Piper have remained viable while more or less maintaining their identity as companies, and even they only barely stayed alive through corporate reorganizations and relocations and economic downturns. They also survived without any real innovation -- the Cessna Skyhawk sold today is pretty much the same as it was when it was first manufactured in 1956. The Klapmeier brothers set out to start a new company and to design and sell a different airplane, and they were successful. 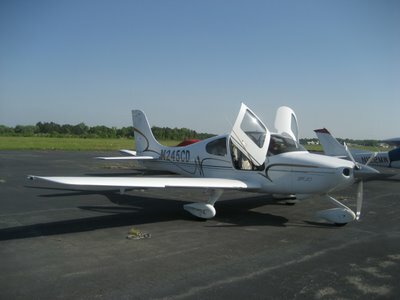 Cirrus, the company they started, was the first to use composite (i.e., plastic) airframes in certified general aviation aircraft, the first to include a ballistic airplane recovery parachute (a "whole-airplane" parachute), and is outselling Cessna, Piper, and every other manufacturer of light single-engine airplanes. AND, they were the first to go with "glass cockpit" technology. 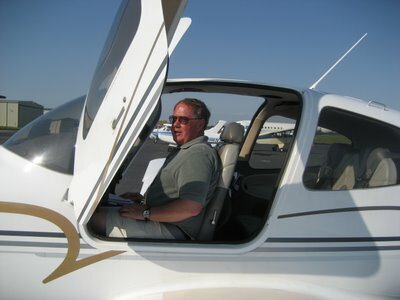 Jeff is an attorney in my firm, a fellow pilot, and the proud owner of a Cirrus SR20. He went flying with me in the Cardinal about a month ago, and we've been scheming for a while to find time for me to go flying in his plane once it got out of the shop. Jeff picked me up at Freeway Airport, a small airport about 25 miles from home. He was waiting as I arrived and as I walked up to the plane I couldn't help but note that his plane is, simply, beautiful -- smooth composite in gloss white with gold and gray accents and leather interior. It reminds me of a 320-series Mercedes-Benz. We took off and headed East. Jeff let me take the stick (it has side-stick controls rather than a yoke) and I flew circles to get used to the plane, then headed us toward Ridgely Airpark. Over the next four hours, Jeff flew practice instrument approaches under the hood while I acted as safety pilot and flew the plane in between and from airport to airport. I concluded that while it's appearance reminded me of a Mercedes, it handled more like a BMW. If I wanted to turn a few degrees, it felt like I only needed to turn my head and look in that direction and the plane would go there. 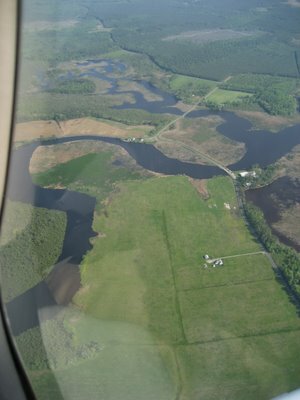 Compared to the control slop in the Cessnas I'm used to flying, the controls were tight, not light, but very precise. 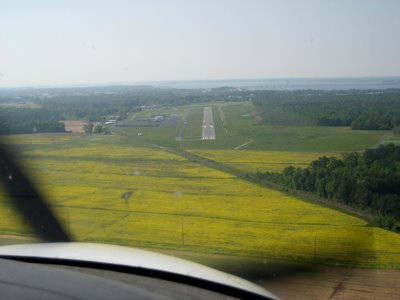 After a couple approaches at Ridgely, we flew to Cambridge, Maryland, for a few more. The area around Cambridge is gorgeous, and I picked out a couple places I wouldn't mind living. The approach to Runway 34 at Cambridge was across large fields that looked as if they had been painted a bright yellow. I wished I could begin to fathom how many yellow blossoms there were below us. After several approaches at Cambridge and a pit-stop for some sodas, we flew to Easton for one final landing. We had seen a formation of three Yaks earlier in the day, and Jeff had seen many more in the morning before he came to pick me up. ("Yak" is short for Yakovlek, a former Soviet-block airplane manufacturer. Since the breakup of the USSR, Yak military tainers have been imported in large numbers into the United States.) There was apparently some kind of Yak fly-in that had been going on. Yaks were departing Easton while we were there, but I caught this photo of the last two that were still sitting there. I think they are Yak-18s or the Chinese variant. We took off from Easton and headed back to Freeway. The approach into Freeway is challenging, but Jeff's landing was smooth and on-target, as were all of his earlier landings.